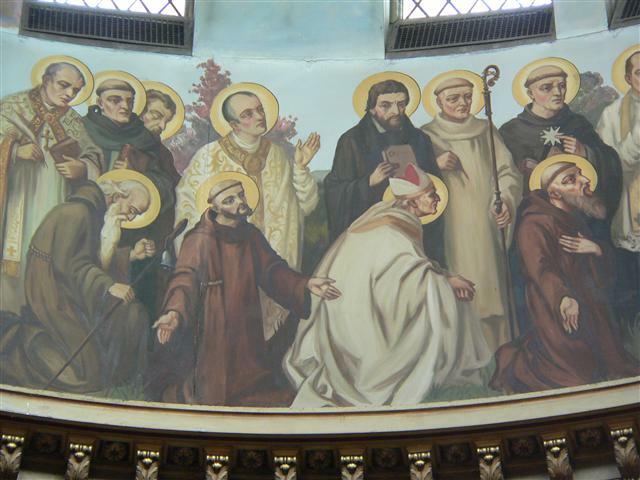 St. Benedict, whose feast the Church celebrates on July 11, is depicted in Joseph Mazur’s painting in the dome of our church. He is one of a group of 12 “Monks, Hermits and Religious,” shown here kneeling at the far right. Photo credit: Gary Kelley. Saturday, July 5 from 10:30 a.m. to 12 Noon ~ Helping Hands Food Pantry in St. Charles Hall. Saturday, July 5 at 8:00 p.m. ~ Bingo will be played in St. Charles Hall. Sunday, July 6 following 10:00 a.m. Mass ~ Reception honoring Sr. Claire Edwards in St. Charles Hall. Thursday, July 10 at 8:00 p.m. ~ Bingo will be played in St. Charles Hall. Saturday, July 12 from 10:30 a.m. to 12 Noon ~ Helping Hands Food Pantry in St. Charles Hall. Saturday, July 12 at 8:00 p.m. ~ Bingo will be played in St. Charles Hall. 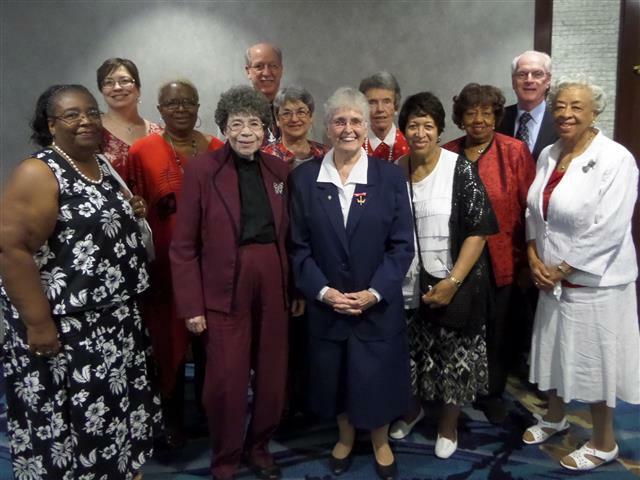 Monday, July 7 ~ Communion Service at 11 a.m.
Sr. Claire Edwards, center, joined by parishioners at diocesan tribute to Daughters of Charity. Sister Claire, our prayers go with you ~ “In 1848, eight Sisters of Charity arrived in Buffalo to serve in education, social ministry and healthcare, establishing the city’s first hospital — Sisters of Charity Hospital — on Pearl Place. Over the next 165 years, the Sisters became the Daughters of Charity, growing their healthcare ministry on Main Street in Buffalo and helping to establish the Catholic Health System in 1998. ” This summer, the Daughters will leave Sisters Hospital to serve in other areas of the country where there are great needs and fewer resources. They include Sister Claire Edwards, who presently serves on our Parish Council, is a member of the choir, and the treasurer of our Ladies Sodality. Please join us in St. Charles Hall for a reception honoring Sr. Claire, immediately following Sunday Mass on July 6. Family Vacation Bible School will be held at St. Martin de Porres Church from July 28-August 1 from 6:00 – 8:30 p.m. The experience is for children ages 5-12, teens and adults and includes dinner each evening at 6:00 p.m. Registration fee is $15 per family. Registration forms are available on table in front vestibule of our church. St. Martha Parish, located at 10 French Road in Depew, announces its annual lawn fete the weekend of July 25–27. The lawn fete features: a beer tent and live entertainment from 7-11:30 p.m. on Friday and Saturday and 3-9 p.m. on Sunday; Chiavetta’s Chicken Barbecue on Sunday from 12:30-5:30 p.m. (while supplies last), Adults $10 and Senior/Child $9; Cash Raffle with $10,000 Grand Prize; games; food; entertainment; all paved areas; rain or shine. For more information visit www.stmarthadepew.org or on Facebook at www.facebook.com/olbs.fete. Event dates and times: Friday, July 25, 5 p.m.-midnight; Saturday, July 26, 1 p.m.-midnight; Sunday, July 27, 1 p.m.-9 p.m.